With near-perfect weather and famously beautiful beaches, this luxurious island will fulfill your destination wedding and honeymoon dreams. As a historic choice for elite beach travelers, Aruba has aptly earned its nickname as “the happy island.” Its 20 miles of beaches in the southern Caribbean Sea are some of the world’s best. The blemish-free sand, framed by tangled fofoti trees, creates a signature, postcard perfect look that is distinctly Aruban—and entirely unforgettable. In short, you can expect nothing less than visual perfection when you marry and honeymoon on the distinct shores of this island paradise. 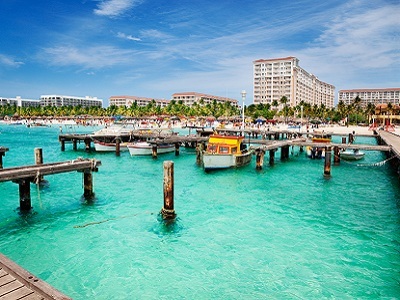 Aside from its unique beauty, Aruba is well-regarded for its calm and clear Caribbean waters and extensive underwater visibility. And, as a famously breezy island, you can expect the perfect sea conditions whether you’re chartering a yacht, scuba diving near shipwrecks or windsurfing along the shore. Should you tire of the endless options at the beach or in the water (we think you won’t), the glamorous hotels, shopping districts and casinos of Palm Beach will welcome you and your wedding with extravagant options to keep you entertained long past the marmalade sunset.